Steve came through the ranks at Liverpool FC where he was captain of the reserves and made the most appearances in 2010; after a trial with Aberdeen he was released by Liverpool in 2011 joining Dutch club, Telstar Velsen. His stay in the Netherlands was short, homesickness bringing him back to the UK and away from football for a few months until he signed for FF Jaro in Finland. He helped the Finnish club avoid relegation, and in 2015, switched countries to Denmark to play for Aalborg. 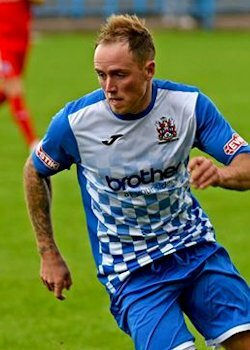 After two seasons, Steve returned back to the UK, joining Skelmersdale United in February 2017, playing until the end of the season going onto make 15 appearances and score twice. He was spotted by Karl Marginson at FC United, who signed the midfielder for the 2017/18 season, where he went onto make 34 appearances and score 6 goals. After making just four appearances, Steve joined Marine.